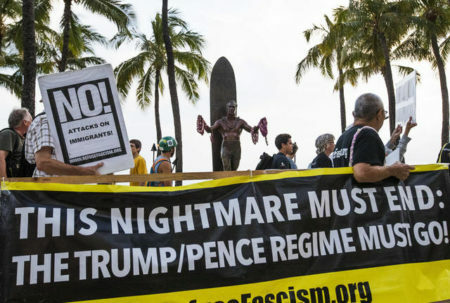 WAIKIKI (USA), july 8, 2018- Just over a dozen demonstrators marched through Waikiki tonight to protest the Trump administration’s immigration policies and to sound a warning about the long-term consequences of a U.S. Supreme Court with a strong conservative bent. The sidewalk march, part of a nationwide day of protest organized by the group Refuse Fascism, started shortly after 6:30 p.m. at the Kapahulu groin and proceeded down Kalakaua Avenue in the Ewa direction. Carolyn Hadfield, who helped organize the demonstration on behalf of Refuse Fascism Hawaii, said the now-discontinued policy of separating migrant children from their parents struck a singularly sensitive nerve with the general public. “This one issue has really galvanized people around the country,” Hadfield said. The protesters were confronted by a handful of people who said they supported Trump and his efforts to stop illegal immigration. Despite testy exchanges, the engagements didn’t escalate beyond a few choice profanities. Hadfield said the modest turnout was expected given a demonstration held earlier in the day outside U.S. Pacific Fleet Headquarters protesting Rim of the Pacific military exercises. She said local activists are coordinating to maintain a steady stream of smaller, low-key protests that draw attention to what they see as the steady creep of fascism in American governance.